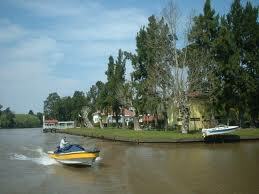 One of the most interesting proposals is to spend at least one evening in Tigre. Hotels, hostels, bungalows, among other type of accommodation are located in Tigre and besides rivers and channels, such as "El Sitio Dorado" located on the first section of the islands, 50 minutes from the harbour, a well known place because of the beauty of its nature and good access from downtown. Best place to relax, walk and visit the variety of landscapes and unforgettable tourist attractions. Equipped with the best amenities and services. Another option might be "Casino Trilenium", with different activities such as shows, restaurants, Disco, promotions and obviously the traditional 1500 slot machines. "Parque de la Costa", offers a great variety of games and passports to spend a full day on this amusement park, becoming one of the places children like most. At the Historic Core, we reccomend to go to the traditional "Tigre Hotel", an outstanding residence, of french architecture that nowadays stands as the "Tigre Museum of Art". As a different option from what usually offers Tigre, "La Real" has an excellent proposal on active tourism and located just 15 minutes on public transportation. The owners of this house receive you to enjoy the plenitude of nature, on this astonishing and colorful area, with a variety of proposals such as island trekkings, island Photo safari, boat trips, full board accommodation, beyond the possibility of visiting the Parana River as well. One of the three companies in charge of the transfers around the Delta is "Jilguero", located at Tigre harbour, stand n° 8, access n° 2. They have wooden public boats, considerably significative since its appearance, for the development of the islands, that achieve a social function and has specific shipping lanes, that works as an ordinary public transportation, with capacity for 70 people, allowing locals and tourists to move around the area, sailing only Tigre, "Carapachay", and "Lujan" rivers.